Be the first to share your favorite memory, photo or story of Reverend Billy. This memorial page is dedicated for family, friends and future generations to celebrate the life of their loved one. Billy Wayne Milam, age 70, of Denison, TX, passed away on Friday, January 25th, at Veterans Hospital Dallas. He was born September 22, 1948 in Denison, TX, to Billy and Humurtis Bowens Milam. 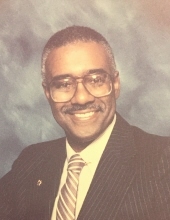 Billy graduated from Fred Douglass High School in 1966, and attended Bishop College. After leaving Bishop College, he enlisted in the U.S. Marine Corps in 1968 and served a year and a half in Vietnam. At the end of his tour in Vietnam, Billy was stationed in San Diego, California where he earned the nickname “Brother B.” While in San Diego he met Ms. George Etta Oatis and they married in July of 1971. Billy was an avid martial artist, and a master at many different forms. He was a 1st degree black belt in Atado Pai, and a 5th level practitioner of Tao Chuan Kung Fu. His love for this form of art lead him to become an instructor. In 1993, Pastor Milam along with Sister Milam founded the New Testament Bible Church Ministries in Denison, TX, where they co-pastored until his death. He leaves to celebrate and honor his life’s journey: his loving wife of 48 years, Pastor George Etta Milam of Denison; sons, Malcolm Milam (Christie) of Garland, TX, and Aaron Milam of Seagoville, TX; sisters, Carolyn Phelps (Homer) of Sherman, TX, Ouida Hicks and Marsha McDuffie of Houston, TX and Erica Milam of Sherman, four grandchildren; and a host of nieces, nephews, cousins and special friends. To send flowers or a remembrance gift to the family of Reverend Billy Wayne Milam, please visit our Tribute Store. "Email Address" would like to share the life celebration of Reverend Billy Wayne Milam. Click on the "link" to go to share a favorite memory or leave a condolence message for the family.